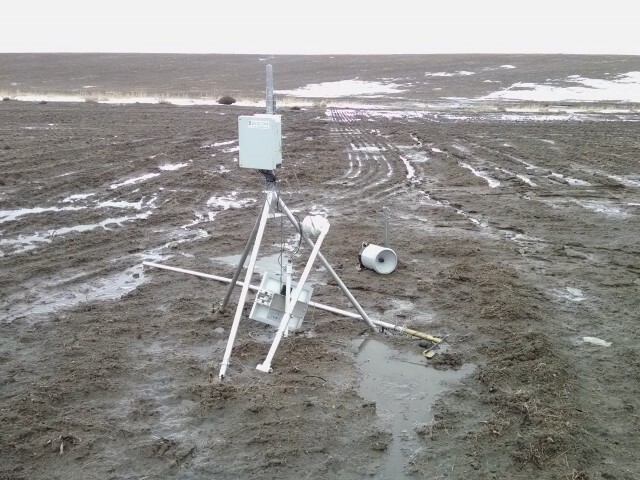 A repeat customer placed a research weather station in the field last fall. By February, anomalous readings from the weather data were observed, including a low battery alarm text message. Everything indicated that something fishy was going on – but it turned out not be be fish at all. Since it was a relatively short 3 hr drive, I offered to make a service call to better understand the situation. Conditions couldn’t have been better for a service trip; mud, snow, rain, and cold are always a refreshing break from the comfort of the office. 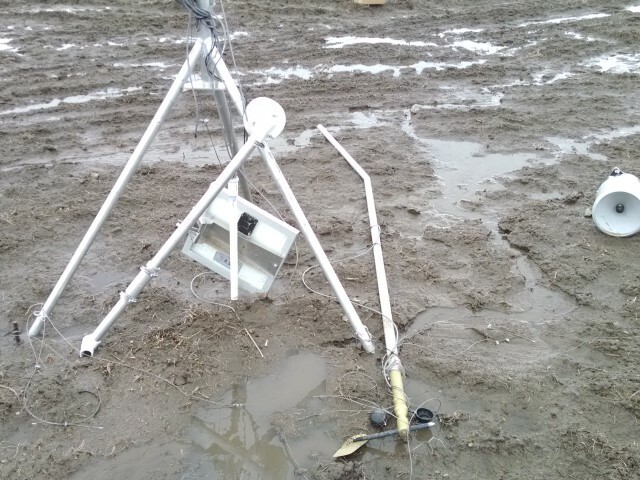 After mucking through a 1/2 mile of … muck, I found the weather station torn to pieces. Mast was down, wind sensor stomped into the mud, cross-over weld broken, solar panel bracket ripped off, and guy line broken. I was also pleased to find that a $600 rain gauge is perfect for kick-the-can. After a short triage it was clear that all of the electronic equipment had to go back for service due to damaged cables. However, most wind sensors that I know of couldn’t have endured the beating the Dyacon WSD-1 received. Aside from the damaged cups, it was still in tact. After two trips slogging over the muddy hills, everything was in the truck and I was ready for the long drive home while the mud cured on my pants and coat. With other professional weather stations, the user would have to wait while equipment (if repairable) was shipped off to various manufacturers for estimates. In this case, all of the damaged equipment was made by Dyacon. We replaced all of the cables, did an ultrasonic clean of the wind sensor bearings, replaced the anemometer cups, replaced the aspirator, replaced the brackets, updated the weather station controller, and did our standard environmental burn-in. All this was done in-house by our technicians. The weather station was tested and ready to go back in the field within two days. Always use a fence to protect your weather station when ruminants are about. If possible, always install weather stations with the comfort of the service technician in mind. The leeward side of tropical islands such as Hawaii and Bermuda are recommended. When buying a weather station consider service and repair in your analysis. 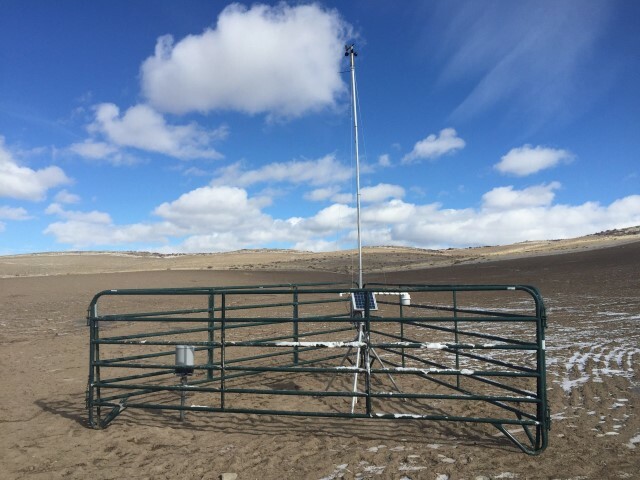 Weather stations that integrate sensors, dataloggers, and radio modules from different manufacturers are not only much more complex to use, but are also more complex to service. The users reinstalled the weather station a few days later, this time with a fence. It think they did a great job, especially when doing it in below freezing weather.